I need to reprise several of the stories and subjects covered by the Orkney Mole last year. One of the most topical relates to the Churchill Barriers, touched upon in The Pentland Ferries Road Race. During the last few years the barriers are often temporarily closed during winter storms for safety reasons because, depending on wind direction and tide height, storm waves break dangerously over these narrow causeways. Prior to this it was left to driver discretion, but incidents of damaged and stranded vehicles were increasing and it was feared to be only a matter of time before a fatality occurred. 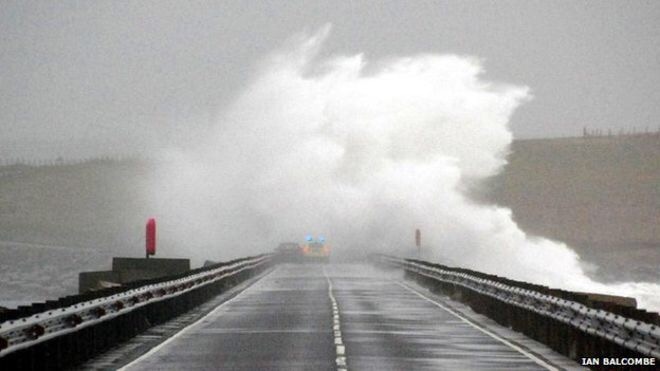 In 2014 a police car was swamped while rescuing a driver trapped when a wave pinned their vehicle against the protective Armco; a barrier closure procedure was introduced afterwards and is now implemented with increasing frequency every time there are high winds. Closure of the barriers of course immediately returns the ‘connected isles’ of Lamb Holm, Glimps Holm, Burray and South Ronaldsay to their original geographical status. Although such closures are usually in place only for a few hours at a time, when the tide is up, it can be hugely disruptive to hundreds of people and families who live beyond the barriers but who commute to work, school and college on Orkney Mainland, as well as those who travel on the Pentland Ferry between St Margaret’s Hope in South Ronaldsay and the Scottish mainland. One interesting reason why the barriers need to be closed more often is that the ‘Blockships’, which were sunk near the barriers as submarine defences during both World Wars, are so decayed that they no longer add much protection as wave breaks. The wind direction also determines which barrier(s) are worst affected on any occasion. Barrier No.2 has the worst reputation and this was exacerbated after the Council erected a ‘wave screen’ at the northern end of this barrier. Unhelpfully, this obscures a proper view of conditions until drivers have committed to crossing. 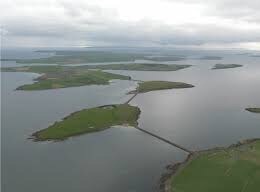 There are four barriers, three of which are clearly seen in this aerial shot looking southwards from Orkney Mainland. 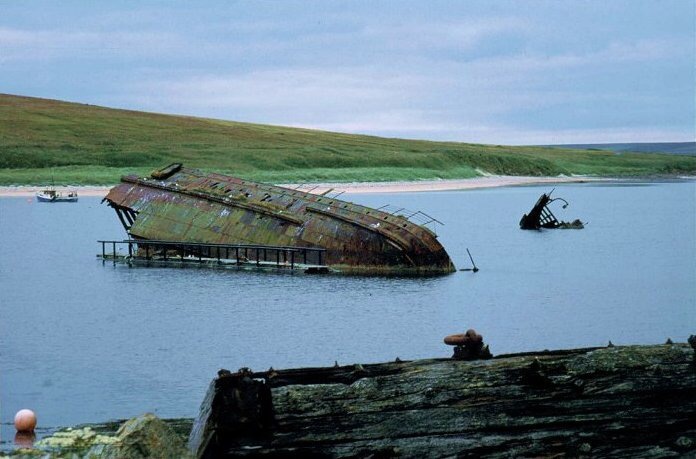 They were built on Churchill’s orders early in the Second World War originally to protect the British Home Fleet based in Scapa Flow – after HMS Royal Oak was sunk in 1939 with great loss of life by a German U-boat that evaded the submarine defences. On the grounds that the barriers served to improve the civilian infrastructure, the use of Italian POW labour in their construction was permitted under the Geneva Convention. This later led to the construction of the unique Italian Chapel on the first connected island of Lamb Holm. The power of the sea is evident everywhere in Orkney. The shoreline is seldom more than a mile or two away so people rarely talk about “the coast” – geographically-speaking that would encompass the entire archipelego. Wave-watching is a popular pastime, as seen the other day at the Brough of Birsay (Marwick Head in the background). We went back to Birsay two days later; there had been a surprisingly heavy snowfall overnight but now the sun was shining, the wind had practically disappeared, and we found ourselves a few Groatie Buckies for good luck (another Mole story perhaps). Next Next post: Not so welcome to Orkney?